How many iPads will Apple sell? The question that preceded Apple’s announcements today will have to be revisited now, with new information about a killer consumer price point, and incredibly low priced unlimited data plans that some predict will drive sales way north of the 75 million iPods and iPhones already in consumers’ hands. The new Apple iPad will retail for as low as $499 for a wi-fi only version without a data plan, to as high as $829 for a 3G version that can consume as much wireless data as you want for only $29.99 per month. A sign the iPad is not ready for sale was the fact the Apple Online Store did not close during the Apple event, as it has in the past for iPhone and iPod launches. Pre-ordering is not possible at this time. With more than a little speculation from both the financial markets and gadget enthusiasts, Apple’s legendary leader Steve Jobs took to the stage at the Yerba Buena Center for the Arts in San Francisco to disrupt the tech industry once again. After proclaiming Apple to be the largest mobile devices company in the world, Jobs unveiled the new Apple iPad. Directly dismissing Netbooks because of their poor quality screens, sluggish processors and uninspiring PC software, Jobs said the iPad is better than a laptop or smartphone, “or else we wouldn’t have made it.” Claiming it is a “dream to type on”, the device has a multi-touch 9.7” IPS display and runs a 1Ghz Apple A4 chip. The device is a only a half-inch thick and weighs 1.5 lbs, compared to the Macbook Air which weighs 3 pounds and is nearly half again as thick due to its physical keyboard. It also will be available with up to 64GB of embedded flash memory. In advance of today’s announcements, there was rampant speculation that the iPad would be a Kindle-killer. 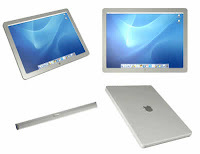 The iBook app and iBook Store present a challenge for Amazon, as does the multi-touch color screen of the iPad. Jobs gave kudos to Kindle and said Apple planned to "stand on Amazon's shoulders and go a little further." Initially, Apple has made deals with the five largest publishers in the world to make books available on the iPad. Extending the iTunes and App Store models, the iBook Store allows consumers to purchase books directly from the iPad and enjoy them immediately. Jobs indicated there are already over 125 million credit card accounts enabled for the Apple download stores, and thanks to their experience serving over 12 billion downloads from these stores, Apple claims to be ready to handle the scale they expect from the iPad. What continues to differentiate Apple is the application software and its App Store. Jobs announced that the App Store has seen 3 billion downloads to date, and the new iPad will be fully capable of running all existing iPhone and iPod Touch apps. Although the size of the iPad is larger than an iPhone 3GS, the apps will run in their iPhone optimized size, which does not fill the screen, unless the user expands the app to fit full screen. The full screen versions of iPhone apps will work in an expanded mode by a process known as pixel doubling, which fills in additional pixels to increase resolution. New apps and games specifically designed for the iPad form factor will launch when the device is available in 60 days, including ones previewed at today’s announcement by ESPN and the New York Times. Additional software demonstrations included a re-work of Apple’s iWork software for the iPad, advanced used of meta data for geo-locating photos and an updated email application. The big surprises for the rapt audience were left to the end of the event, in classic Apple style. Although the entire presentation showed the device and referenced only wi-fi connectivity, the iPad will be available with embedded 3G capabilities. In the US, where a data plan typically runs $60 per month, the announcement today by Apple that the iPad will be available with a two-tiered, no contract data plan - $14.99 for only 250MB of data or $29.99 for unlimited data, is likely to drive more consumers to adopt the 3G capable version, including ones who may not own a smartphone today. I couldn't agree more about this eventually dominating the market. Right now it's not a device which will be hugely popular. But I bet my life on it that by version 3.0 the opinions of a lot of people will have changed and people who hate it now, will love it.